The Quest represented something new for JCVD, both being behind the directors chair and being in a period film, the latter of which actually fit him just fine. His performance was better than in many of his films, and he seemed pretty comfortable. Roger Moore was great as Dobbs, the scoundrel who cons Chris and then turns into an ally. One of the problems I had was with the very beginning and end of the film, which fast forwarded him to the present as an old man, but it never seemed to go anywhere. They would have been better off just going straight into the story, and the aging makeup wasn’t very convincing. The cinematography was well done, until later in the film, where some tilted camera movements and slow motion for scenes that didn’t required it brought too much attention to the camerawork. Once we get to the actual tournaments, it felt just like a replay of Bloodsport. Montage sequence of different fighters duking it out, check. Have a fellow martial arts brother killed in the ring by main bad guy, who is a large dude, check. JCVD helicopter-kicking the big bad guy into oblivion? Cool, but check. Too much felt familiar here to really enjoy it as much as I wanted to. The fights were well done, probably JCVD’s best since Bloodsport. It was great to see different styles fight each other, and for the most part was well shot, except for a few spots. 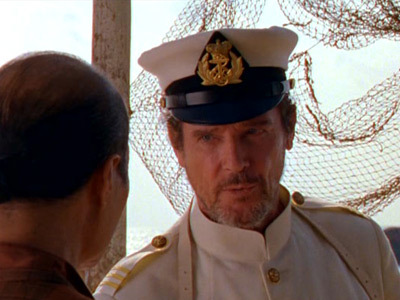 (I could have done without hearing James Remar commenting incredulously about what the kung fu guy was doing. “ Now he’s a monkey!”. Ugh.) JCVD’s fight with the kung fu guy was pretty good, and JCVD showed he could at least hang somewhat against that kind of fighter. The final fight didn’t have the dramatic tension it should have had, as it seemed to stretch things out dramatically. Abdel Qissi may be a good fighter but doesn’t show it here, leaving JCVD to do the heavy lifting for their fight, or maybe just something with the fight choreography. Most of the other fights in the film were far better. Not the best JCVD film ever, and hearkens back to Bloodsport a little too much, but is a pretty decent film to fire into the player on a Friday night. Better yet, just pop in Bloodsport. Previous How about a new credit opening for Enter The Dragon? I would say I pretty much agree with all of your assessments but I still love The Quest. It captured my imagination as a youth and it will always have a soft spot in my heart for that. I, quite humbly, disagree. I found ‘The Quest’ to be a huge disappointment. Not a single thing about this film appealed to me. The fight choreography and acting were below average, and the story was not engaging. I found ‘The Quest’ to be an awful film. I watched it once, a little over a decade ago. Perhaps if I were to watch it again, I would react less negatively to it. Our initial reaction to a film isn’t always ‘accurate’.